We’d love your help. Let us know what’s wrong with this preview of Pride by Rosie Somers. To make matters worse, she’s falling hard for fellow st Seventeen-year-old Gabriella Pierce is used to taking care of herself, but she’s about to become responsible for a whole lot more. When she gets a visit from three men claiming to be defenders of fantastical rings imbued with the powers of THE CARDINAL SINS, her life is changed irrevocably. 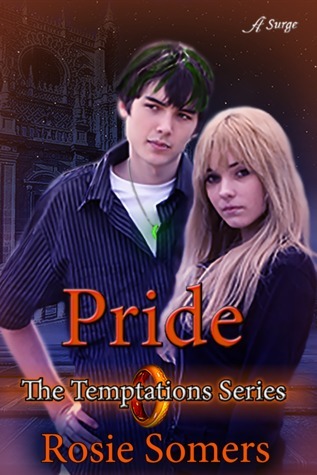 Pride is aimed at the YA market, and is the first in a planned series (presumably one for each of the seven deadly sins). It incorporates elements of other well-known YA series such as Harry Potter and Divergent, (an orphan who is the ‘chosen one’ fighting the forces of evil). It has that fast pace and addictive quality which makes it hard to put down. While elements of the plot are similar to those of other popular YA series, the seven sins idea is unique, and provides an underlying Christian theme to the battle between good and evil. Having said that, the plot isn’t overtly Christian, no more so than the Divergent series. There were some minor writing issues (e.g point of view shifts and run-on sentences), but nothing that detracted from the story—which indicates how compelling I found it. The one possible fault was the characters: the fast pace of the plot and the (relatively) large number of characters meant there wasn’t a lot of time devoted to the development of individual characters. However, as I’ve mentioned, it is the first novel in the series, and I would expect that now we’ve been introduced to the concept of the sins and the stewards, future books will be able to show more in the way of character development. Click here to see review on my blog! I received an email about participating in the blog tour for this book after having helped in the trailer reveal(which you can see trailer below too). The summary sounded interesting and right up my alley so I was happy to read and review! I love fantasy books with mythological parts and romance! Which Pride by Rosie Somers delivered greatly! It was a fast paced Fantasy that I couldn’t put down! If I enjoyed so much Click here to see review on my blog! If I enjoyed so much your probably wondering why I rated 3 1/2 stars. Well I was torn between 2 ratings with this one. I really enjoyed it. I mean I read the whole thing in one setting! But it felt like it still lacked in places. Reading it that quick had part way to do with how short it was and that in turn kinda confused me on how to rate it. I thought Pride could have been a very promising book and opening to a great series if it had more detail and character development. While I enjoyed all the character’s and story very much, I thought it felt rushed and therefore lacked. It may have been short but it was thrilling enough to grab my attention and I can’t wait to continue Gabby’s story in the next installment. Rosie Somers has made it to my Author’s to watch for list! I plan on buying for my collection just because I did enjoy alot and I have a thing for collecting book. Specially series I read and since I plan on continuing this series I will probably buy. Will you continue the Series? Enjoyed it. Looking forward to the next book in the series.